BRECOflex CO., L.L.C. the leader in the polyurethane timing belt industry is pleased to introduce the newest belt option in our move-series, the AT10move-M. This open-ended version joins the successful BFXmove truly endless timing belt that became available last spring. The move-series represents the next generation of timing belts, because it offers 75% higher stiffness and 30% higher transmittable force than the standard AT10 belt. In linear drive applications, the high tensile strength and high stiffness of the “move tension members” ensure faster settling and more accurate positioning with a very high degree of precision. 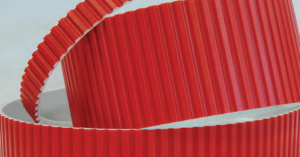 There are many advantages that come from the special features of move timing belts. Namely, the high load-bearing capacity of the tension members, optimized tooth shape and low-friction coefficient of the belt coating. Furthermore, these features add to the long service life and low friction which so many customers find important. These properties proved superior for BFXmove, and will make AT10move–M the most outstanding option for linear drives. Move-series AT10-M is currently available in 25mm, 32mm, 50mm, 75mm and 100 mm widths with galvanized steel tension members. As you can see, the diagram below demonstrates the belt stiffness of the AT10move compared to other common belt sizes. One can clearly see that the AT10move opened ended belt provides a higher stiffness in a smaller belt. 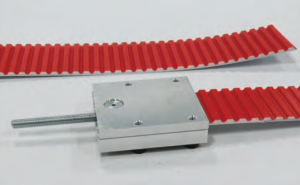 This enables the machinery to run efficiently with a more compact belt. For more information, download the move-series engineering bulletin or contact BRECOflex CO., L.L.C. at 732-460-9500 for more information.